Those who trout fish Pennsylvania often know many streams can be fished out a day or two after being stocked. Fortunately, that’s not the case with Brodhead Creek. 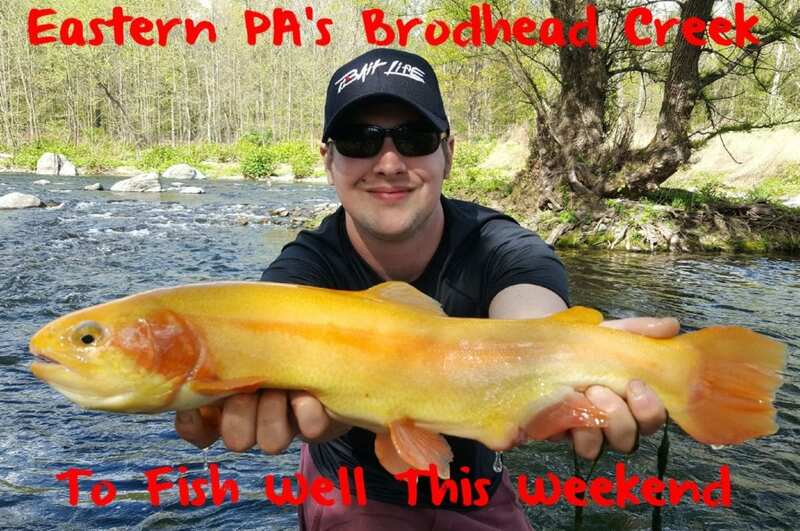 Larger than your average Eastern PA creek, Brodhead is no secret to anglers and large enough where trout can spread out and not get picked off by fishermen as quickly. As of yesterday there were still plenty of the fish in the system and that will likely remain into mid May. We didn’t catch a pile of trout yesterday, but managed a large golden (which we released and was still there as a today), one brown, several brook trout and a dozen rainbows in a half day’s work. We talked to more than a dozen anglers who agreed with the tough bite. While we did see an endless number of trout surfacing they weren’t as eager to bite as you might expect, which could be a reflection of heavy fishing pressure. Even midweek and at high noon most holes were clogged with anglers, some fishing and others trying desperately to snag golden rainbows with huge spinners. Once the snaggers hit a hole it can spook all the trout. Meanwhile, we weren’t discouraged and fished a small section of water thoroughly in hopes of filming Pautzke Outdoors. Persistence paid off. Armed with Pautzke Fire Bait and Chartreuse Garlic, Pink Shrimp and Natural Deluxe salmon eggs we constantly switched offerings to keep the trout interested. We fished some under a float and bottom bounced others and found success with both methods. The large trout came on Chartreuse Garlic Fire Bait where as the smaller rainbows hammered the Pautzke eggs. We found trout in several sections of water. Anywhere public access was available trout were present, which is a clear sign the Pennsylvania Fish & Boat Commission stocked there on their last trout plant. We didn’t catch many trout in the top end of large holes rather in the mid section or near the tailouts. Behind large boulders (even in fast water) also held fair numbers of trout. We even found trout in turbulent pocket water where most anglers don’t target. Because this is a larger creek we couldn’t sight fish like you can in many Eastern PA waters. Instead, we thought like a trout and focused on areas we knew would be attractive to a trout. Employing four-pound test was imperative as the water remained clear even following Monday night’s storms. As the water continues to clear light line will become even more important. The downfall was the snaggers, which is common many places. To us having an opportunity to catch golden rainbows is special. The PA FBC does a great job at raising them and while catching them in the mouth and keeping them is understandable, watching two locals heave salmon-size spinners and rip them through the water isn’t fishing. There were two golden rainbows left in the half-mile stretch we targeted. Meanwhile, the snaggers got one about noon and tried for the one in the hole we were fishing, but we unsuccessful. We were fortunate to come back around 4pm and catch and release it (on Facebook Live). We released all the trout we caught in hopes you’ll be out there catching them this week/weekend. Editor’s Note: Pautzke salmon eggs and Fire Bait are available at Walmart and Bass Pro Shops. For more info on fishing in Eastern PA and updated trout stocking schedules please visit the PA FBC at http://www.fishandboat.com/Fish/PennsylvaniaFishes/Trout.